← Now Available for Preorder: My New Novella! Diary of One Who Disappeared is now back from the printers, and I’ve gotten my author copies (check out my Facebook page for the unboxing), yay! The paperback will be available in fine Singaporean bookshops by start of April (and, as you can see from the photo, it’s actually already for sale at the new Huggs-Epigram Coffee Bookshop), and the ebook will be available on all major platforms as well (more on this later). So, now that the novella exists (plusyay! ), it’s time to post my upcoming event schedule in support of the book’s release. If you’ll be in Singapore for the month of April, or in Penang during Star Wars Day, please come on down to the below events to help me celebrate! Michelle had me on her show last year to talk about LONTAR issue 10, and then graciously agreed to moderate a LONTAR retrospective panel at the 2018 Singapore Writers Festival, so I’m very excited to talk with her again, this time about my own fiction. This will be the official launch for the book, so if you can come to any event, come to this one. Sales for this weekend are very important, and can determine whether the novella makes Kino’s bestseller list, not to mention national bestseller lists (for which I can only hope). A big jump-start at the beginning can also result in healthy regular sales months and years afterward. Kino has been a wonderful partner with Epigram Books, and I’m very grateful that they’re allowing us the space to launch the book there. 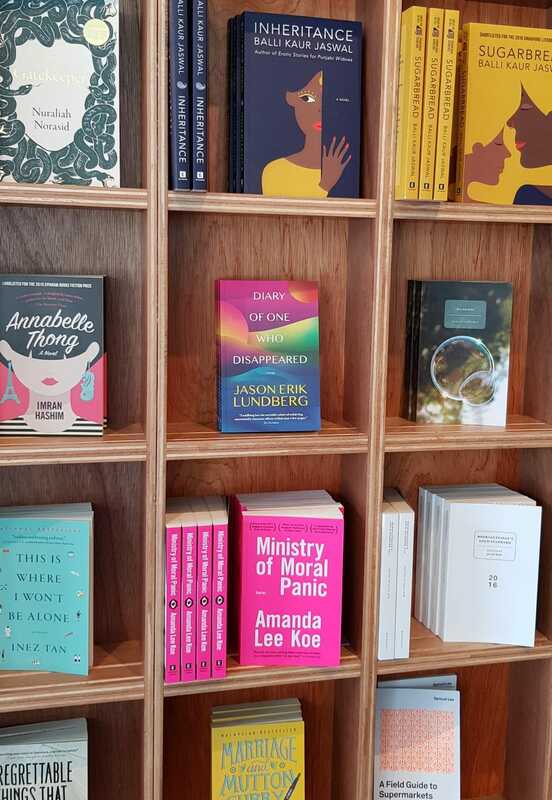 If you’ve read Singaporean news lately, you know that the Huggs-Epigram Coffee Bookshop (a collaboration between Epigram and Huggs Coffee) has just opened its doors, the only bookstore in the country right now selling books that exclusively focus on Singapore and Singaporean writers. As a continued part of that grand opening, the Artist-in-Attendence programme has been established to give Singaporean writers and artists an exclusive table to work on their art. “If you’ve always wanted to know how authors work or gain inspiration, or simply wanted to thank your favourite author—here’s your chance. Don’t be shy, come and say hi.” Also, the coffee is pretty damn tasty. Since my first invitation to the George Town Literary Festival in 2016, I have been welcomed by Gerakbudaya’s director Gareth Richards and his wonderful staff, and made to feel seen. So I was especially excited when they agreed to bring me in to their sister store, Hikayat, to launch the book in Penang. As I mentioned above, the event will take place the day before Ramadan starts, i.e. Star Wars Day (May the 4th…), so expect me in my Empire Strikes Back shirt. Thanks in advance for showing up and allowing my fiction some space in your life (doubleplusyay!). If you’re unable to attend either the Kinokuniya or Gerakbudaya launches, you can still order the book from either store, or direct from Epigram Books or Local Books; be sure to indicate whether you would like a signed copy.